With the right mix of ingredients, grain bowls are as healthy as it gets — they’re are light yet satisfying, and a great way to use leftovers. 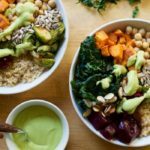 This colorful grain bowl features lots of different nutrient-rich winter vegetables and other superfoods. It’s loaded with fiber to fill you up, and even though it’s vegetarian, it packs 14 grams of protein. Our winter superfood grain bowl calls for bulgur, but any whole grain can be used. Sunflower seeds give it just the right amount of crunch, and the tangy lime and avocado dressing marries all of the flavors. With a few ingredients prepped ahead of time, like a baked sweet potato or a big batch of grains prepped for the week, this lunch or dinner comes together in a few minutes. 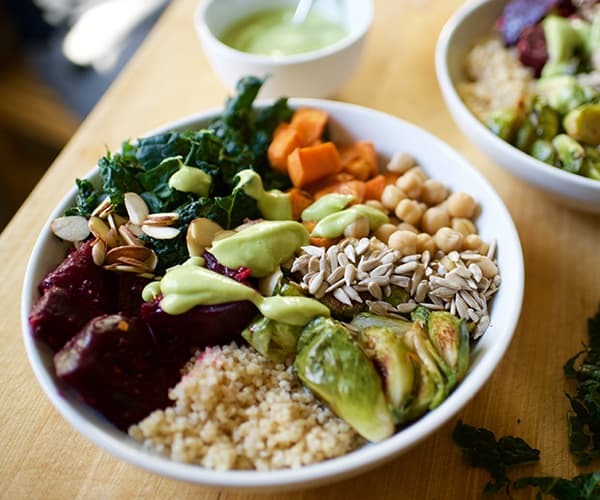 This colorful grain bowl features lots of nutrient-rich winter superfoods. It's loaded with fiber to fill you up, and even though it's vegetarian, it packs 15 grams of protein. Place beets and sweet potato on a large baking sheet. Drizzle with ½ tsp. oil. Season with ¼ tsp. cumin, salt and pepper (if desired). Bake for 10 to 15 minutes; stir. Add Brussels sprouts. Drizzle with ½ tsp. oil. Bake for 20 minutes, stirring halfway through, or until vegetables are tender-crisp. While vegetables are baking make dressing by placing avocado, water, lime juice, vinegar, remaining 3 tsp. oil, garlic, honey, remaining ¼ tsp. cumin, and salt in blender (or food processor); cover. Blend until smooth. Set aside. Evenly divide bulgur between four serving bowls. Evenly top with kale, chickpeas, roasted vegetables, dressing, almonds, and sunflower seeds; serve immediately. Spinach, Swiss chard, or collard greens can be substituted for kale. Broccoli can be substituted for Brussels sprouts. Legumes can be substituted for beets and sweet potatoes. Add a protein to make a great lunch option for the non-vegan plan or omit the honey and enjoy as a lunch option for the vegan plan.